What do you think of these Silicone High Performance Wedding Bands? Are you one of those people with a really active life style, you usually do lifting, go climbing, you jump, flex or are under water or full of mud? Or are you in a profession where wearing a metal wedding ring will risk your life like electricians, mechanics or firefighters? Here's the perfect solution for you to keep your commitment with your spouse and with your lifestyle. 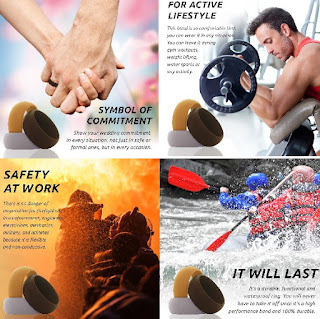 More than just a rubber ring, it's a high quality silicone wedding band very durable and resistant. Resists all the adventures in your life or overcome the difficulties in your job. Safe to use, very comfortable and ideal for adult fingers. The material stretches to fit and it keeps its original shape, it remains durable over the years. It's extremely light and it has a very modern look.